Is the release track "First release for everyone" also included in the first rollout wave or is the specific release track "First release for selected users" required? That isn't clear to me after reading the blog article SharePoint communication sites begin rollout to Office 365 customers. RE: Has roll out of Communication Sites started for both First Release tracks? Re: RE: Has roll out of Communication Sites started for both First Release tracks? How is progress on rollout for First Release for Everyone? Is there an updated ETA? We have enabled first release and we're able to implement it since beginning of July. However, as we check this morning, the option for communications site have been removed, and the existing site implemented with communications site went haywire. @Andy Haon wrote on twitter yesterday that the roll out to some organizations with "First release for everyone" selected has begun. Our First Release Everyone tenant got the update yesterday! Yay! Very cool! Hasn't hit ours just yet, so still using my personal tenant. Thanks all for the information on this. I'm hoping we see more availability soon - i'd rather not go on implementing our new Intranet without these new sites/templates. We are still waiting on this rollout for our tenant. Any idea on when the roll out will hit O365 Developer versions? Office 365 Developer subscriptions should also have the first release settings. Check the admin center. Any update on how the rollout is going. Our tenant is a first release for everyone tenant and we haven't gotten the release yet. We're beyond anxious to get it and wondering, if I switch to first release for select users will I then get it or am I stuck just waiting until it goes out to the world? I have a specific use case coming up and I think a communication Site would be perfect for but I need to get started ASAP to find out or work a different track. It should be rolling out to every organization by this point. 100% production rollout was announced August 14th for communication sites. How are you creating sites? The main entry point is the plus button from SharePoint Home. .... 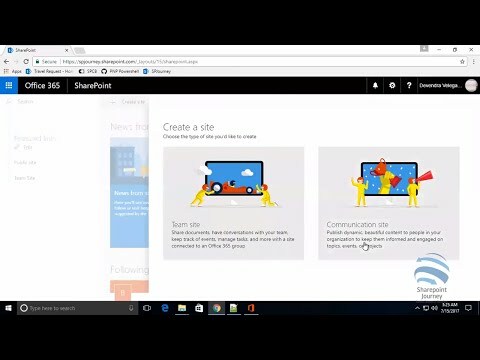 So, just watches this youtube video: https://www.youtube.com/watch?v=YtffgaPfsnw and notices he was able to click on the word Sharepoint next to office 365 in the top bar. Sharepoint doesn't even appear there for me. I was able to manually type in the URL's I saw in his video and that took me to a page I've never seen before which allowed me to create the communications site. So... no I need to see what's up with my experience with the missing sharepoint links and such but at least I can now try out the communications site. Thanks for your help. It's odd that you don't see SharePoint in the app launcher, even in the all tab. The only scenario I can think of where that should happen is if your account doesn't have a license assigned. We're good, i forced this into the tenancy by setting our First Release flag. Much thanks.